Technically these are just plain CD warriors, but when GW release a new regiment they will be an elite unit. 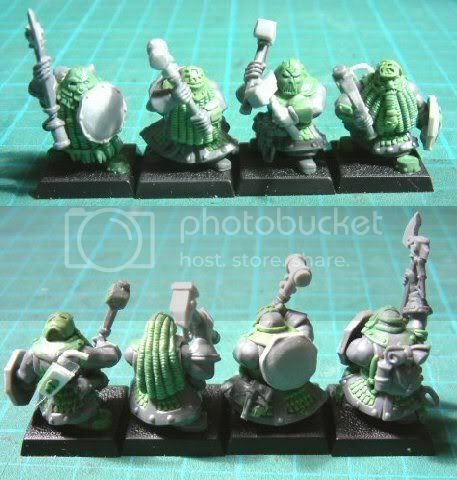 I mainly used the Dwarf miner sprue and a few bits from the Dwarf warrior and Dwarf warmachine sprues. The second one needs some work done on the gloves, beard, boots, shield and cloth on his shoulders. I love the way the mask came out and will do a few more of this. The third one... Whooee what a woman :0 The mask came out very well, and the pose is quite dramatic compared to most IMO. She needs some work done on her hair, gloves and boots. The last one is my favourite. He's got his mask pulled up ontop of his head, and a fairly traditional face. On his back he's got a saw and a bomb. Although you can't see it, his shield has got a skull with lightning coming out of the top which I'm not too happy with. These are superb, as if we should expect anything else after the lord in your profile pic. I actually wouldn't have realized that the third one was female if you hadn't mentioned it! I was just thinking, "hey cool dreadlocks!" until I read the post. So yeah, 'what a woman' is right. I particularly like all the gear that they have, and the shield-as-cog idea is working well. Do ye think we could get some close-ups of the individual models? i agree with Khan, i would love to see some close-ups of the one with the mask on the top of it's head. Great work btw. Thats really good GS work ! Can't wait to see a unit full of the first model! again good work on the seconds mask! I like the spacemarine-esque filter on the front of the woman's mask, cool dreds too! But that last one is by far my favourite, love to see a close up of the face!! All looking good so far can't wait to see alot more!! Amazing! I also confess i didnt relaise it was a woman. Loving the mask pulled back look, its realy cool. Can we have individual pics? Excellent work - again! GSF - I really love your work:-) Your Tyrant rocks and I can't hardly wait any longer for that Iron Bull of yours. Wow, they are fantastic! I have done a few with dreadlocks as well, but none of them are female And I love the idea of the pulled up mask. I plan to do another 5 and then take a close up of each model. Then I will paint all of these and the champion I did, so I'll have half a unit completely done before starting on the second half. i think the quality of them all is really great. the whole mask being pulled up s really good because it ties your masked guys in with the classic big hat style, sort of like a tribute. I agree with torn, I thought of predator almost right away. I hope it'll look more feminine once painted. Speaking of which, paint them! Stick 'em wiv knives. Stick 'em wiv arrows. Stick 'em wiv swords and spears. Stick 'em where it 'urts. But most importantly, stick 'em when they's not looking! Has been looking for inspiration for a smaler mechanical mount for some time now - and a Iron Bull seemed perfect. Guess it's back to the drawing board and finish up that concept for a mech dragon then. Here is the first one painted.��I need to do his base, but I can't find my sand anywhere and I couldn't be bothered to sculpt it.��I also forgot to do his eyes. Sunburst Yellow highligh on cutting edge. This post was last modified: 07-28-2007 02:36 PM by Grimstonefire. That dwarf-face shield is the coolest shield ever. I like the weapon, too - very interesting blade! Well done sir. Fully agree with Khan! - that dwarf face is such a great detail. I also love the level of details on each mini. 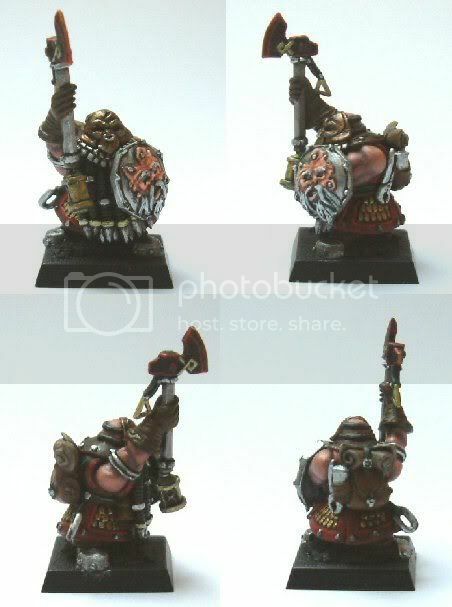 Awesome stuff Grim, the start of a truly awesome Chaos Dwarf army! Miners FTW! They look great grim, nice paintjob/conversion. Wow the concept behind them and the excecution is brilliant. It will be a pain to finish an entire unit of those so I hope you keep it up.